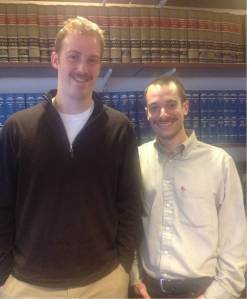 Thornton Law Firm is proud to support its two “Movember” participants, Dan Lustick and Charles Moore. Dan and Charles are both valuable members of our birth defect practice area. Dan, who holds a Master of Public Health degree, joined Thornton Law Firm in early 2011 and is the firm’s Chief Medical and Science Researcher. Mr. Lustick’s experience includes researching and analyzing the causation and exposure data for birth defect cases. Mr. Lustick received his BA from Colorado College and Master of Public Health from Boston University School of Public Health. Charles Moore has been working as a paralegal for more than two years and joined Thornton Law Firm in 2012. His primary experience is working on complex toxic exposure litigation including document review and investigations in birth defect cases. Mr. Moore graduated from Boston College in 2011 with a Bachelor’s of Arts in Political Science. Dan and Charles have enthusiastically joined the international Movember fundraiser, where participants grow a mustache for the month of November to raise awareness and funds for men’s health, specifically prostate and testicular cancer initiatives. Funding programs with the LIVESTRONG and Prostate Cancer Foundations, as well as their own initiatives to bring researchers together on men’s health issues, Movember’s 2012 U.S. campaign raised $21 million. Movember is now one of the world’s leading funders of prostate and testicular cancer research and awareness. One of every two men and one of every three women will be diagnosed with cancer in their lifetime. As a firm dedicated to helping and supporting individuals suffering from cancer, Thornton Law Firm is proud to support research to prevent and treat this dreaded disease. Check out Movember’s website to learn more about the initiative.